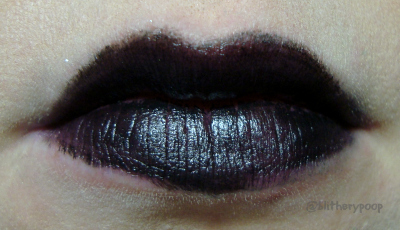 I forget exactly how I stumbled upon Portland Black Lipstick Co., but my jaw dropped once I did. I bought a bunch of samples and there are more swatches on the way soon. Today I'm addressing the bold claim that they make, that theirs is "The best ever!" Tests needed to be done, so I gathered up a couple of competitors. This is the one to beat. Nichole and I were both very impressed by all of the Macaron Lippies in general. 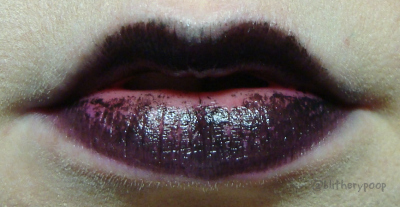 Chambord is glossy and well-pigmented. It doesn't stick to the inner curve of my lips well, but that's a problem for me with most lipsticks that don't feel like death. BLACK!! Wow! Feels great, applies easily, and has excellent color payoff. It's not an idle boast. I can't really proclaim it the best, because I've only tried maybe ten ever...but it's got a strong claim as probably the best of those. It needs liner though, or this happens...and almost right away. Bottom line: My recommendation here depends on what you're looking for. If you're going to a Halloween party and will probably never wear black lipstick again, get Pagan Angel. If you actually wear black lipstick, go with Black. Chambord shouldn't be overlooked either, since it's half the price of Black and glossier. 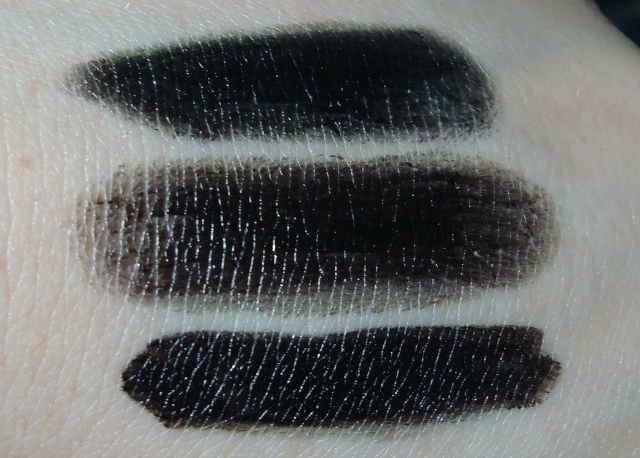 All three really need liner, and all look more even/less patchy in person. Do you wear black lipstick? Is there another I should try? I wear black lipstick a few times a month. 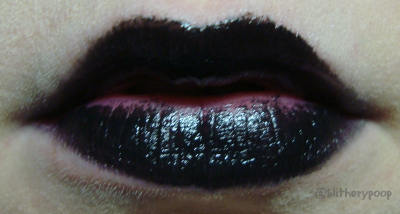 I am considering getting some of the Portland Black Lipstick samples, since they have fun colors. My personal favorite black is Pretty Zombies Black Cat since it's a liquid to matte formula. The downside would be the companies communication with clients, but the product is great. 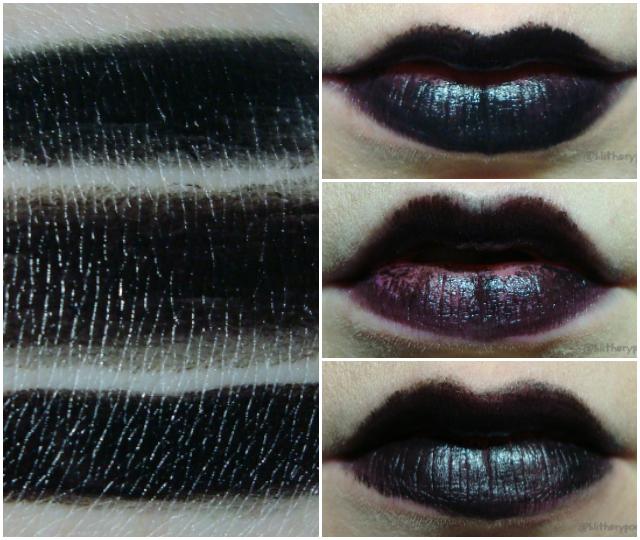 Have you tried OCC Tarred? 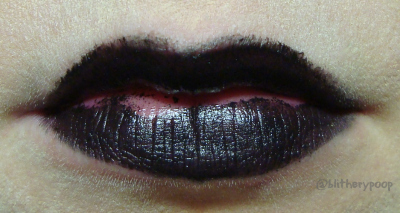 Life's Entropy has a black Lip Theory that is supposed to be pretty amazing. 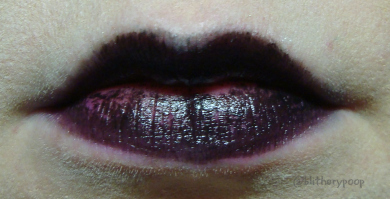 Portland Black Lipstick Co. Black seems to be the most opaque.